Success Through Manipulation: Subconscious Reactions That Will Make Or Break You by Colin Christopher Review - My Life Is A Fairytale That Will Never End. First of all, this book isn't about how to manipulate other people, but how to manipulate your own thoughts and get a better outcome in a situation. I got this book last year for review. I was really excited about it and couldn't wait to read it! So, I started reading it and in the beginning of the book, there was this exercise "Identify your habits. What have you learned to do that you no longer think about but do automatically? What portion of you day is spent performing habitual behaviours and what portion is spent learning new experiences?" Funny thing happens when you actually write it down. Oh my God, I couldn't believe it. Everything that I do on daily basis is a habit. Automatically. I kept staring at the list and the more a stared the more pissed off I was. I was so mad and determined to change stuff that I consciously started thinking about it and pick other ways to walk to work, going to different stores to buy stuff, going to different coffee shops to get my coffee.. I was mad at the book too. This is also the reason why I picked it back up after so long. Call it willingness to disagree with the facts or whatever. I was just so shocked that everything in my daily life was so automatic that I felt so insignificant and plain boring. I projected my anger on the book, and after months I figured it wasn't really the book, but me. This book is good. This book was about overcoming difficulties that we face in everyday life. To understand what the actual problem is and how to program our unconsciousness to develop another, better, outcome. It was also very good at giving an insight of the basics of the problem we face daily. It's interesting, cause you think you are doing something because of something or because you think you want to, but in reality is that you are doing something because for a completely different reason (that you usually don't completely understand). Each chapter of this book covers a specific Law of Manipulation. Every chapter defines the Law and gives you background information to help you understand the actual Law. It discusses how conventional and unconventional thinkers react to and/or use the Law. On the end of every chapter, you find thought manipulation action steps that you can take to critically apply the Law to your own situation and change your thinking. Sometimes is easy, most of the times is really hard (as you've read in the second paragraph). The thing that I liked the most about this book was that it explains really well how our unconsciousness reads the language. You might have heard about it, or you might have not. So basically, our unconsciousness doesn't understand negation. We all use opposite language. That's a fact. And here comes the problem. When you say "Don't be nervous, you are not going to fail this", what is actually translated to you unconsciousness is "Be nervous, you are going to fail this", the combination of language and imagines imprinted on your unconsciousness will push you further to be nervous and thinking of failing. This is a powerful tool and you have the power to change it. This book explains in very details how to prevent this kind of thoughts. And I think it's great. Because really, how many times do you say to yourself "Don't panic" or "Don't be afraid" or "I am not going to fail this exam"? Loads. And here is your solution. Stop using opposite language. Don't get me wrong, it's a hard habit to break. But if you start paying attention to it, I am sure you can work it out. What I was critical about in this book was how sometimes it felt like unconventional thinkers were this special people who have it all figured it out and emotions don't really affect them. How they can always stay calm in stressful situations and react rationally. While the conventional thinkers were perceived as people who all too easily fall into bad habits and not so wise behaviours. Or that they didn't perceived success as the main goal. I didn't agree with it sometimes. In stressful situations it's hard to stay calm, and sometimes it's good to let our emotions control us. It makes us feel alive. In the end of the day, we are all human beings. I guess what I want to say is, if we keep wanting more and more and more success, will we be ever truly satisfied with life? This may be my mechanism of defence talking, but I think feeling content with yourself and your life is very important. My favourite thought in this book was "When you believe something completely, it does not matter what the reality of a situation is. The belief will override reality". This is a powerful statement and it's called The Law of Dominant Belief. I loved this chapter! I used to believe in so many stuff while I was younger and surprisingly, or not so surprisingly according to this chapter, my beliefs always came true. I don't know what exactly happened during my journey to make me question things and stop believing that strongly in things that I want. I think it's time to reconsider. And start believing more. Regarding the psychology department, this book has a very practical value when it comes to hypnotherapy and unconsciousness dynamics. And it covers all the Laws that I can think of. For example The Law of language translation, of triggers, of association, of reverse effect, of false memory, of visualization, of subliminal conditioning, of the comfort zone, of will power, of labels and so much more. The author is knowledgeable and has a lot of experience regarding the subject. There are also case studies at the end of the book, which I found very useful. The key message of Success Through Manipulation is that people can overcome their problems and achieve their goals using different techniques of coping or reprograming their thoughts. There is a light at the end of the tunnel. It takes time and effort, but if you are willing to fight for it and believe in yourself along the way, you are going to succeed. Christopher, C. (2012). 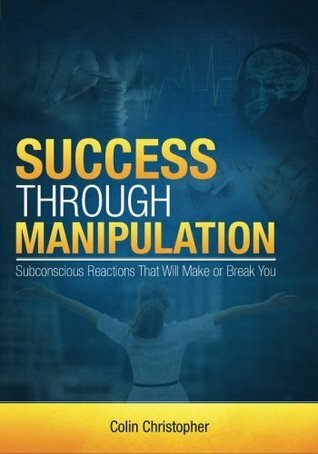 Success Through Manipulation: Subconscious Reactions That Will Make Or Break You. Manchester House Publishing. Manchester.